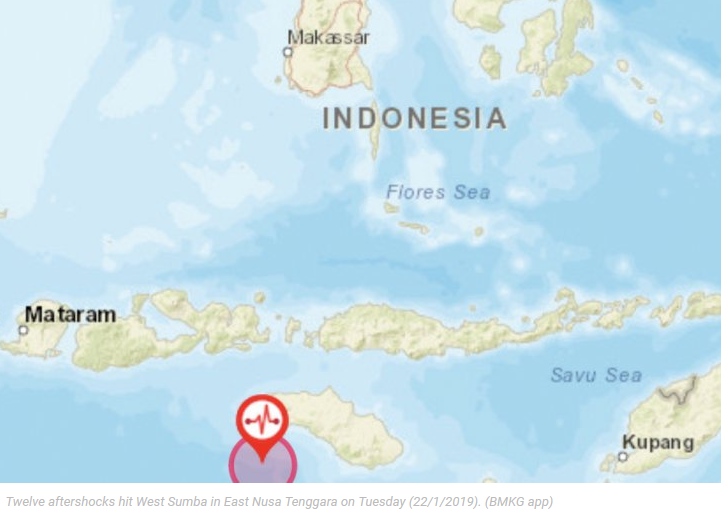 Kupang, E Nusa Tenggara, (ANTARA News) - West Sumba on Sumba Island, East Nusa Tenggara (NTT) Province, was hit by 12 aftershocks, Tuesday, as of noon, following an earthquake measuring 6.2 on the Richter Scale that occurred at 7:59 a.m. local time. The aftershocks took place from 8:08 a.m. to 10:18 a.m. local time, Arief Tyastama, head of the Waingapu geophysics office, stated here, Tuesday. Magnitudes of the aftershocks ranged from 3.1 to 5.2 on the Richter Scale. West Sumba was jolted by a 6.2-magnitude earthquake, but it did not have the potential to trigger a subsequent tsunami. The quake`s epicenter was located at 10.52 degrees southern latitude and 119.05 eastern longitude, some 92 kilometers (km) southwest of Waikabubak Town, West Sumba District, and at a depth of 47 km, according to Rahmat Triyono, head of the earthquake and tsunami department of the Meteorology, Climatology, and Geophysics Agency (BMKG). Following the earthquake, West Sumba was jolted by two aftershocks, respectively measuring 5.2 and 3.2 on the Richter Scale, Triyono stated. The tremors were felt by local residents of Tambolaka at IV-V Modified Mercalli Intensity scale (MMI) and in Waingapu, Sumbawa, and Bima at III MMI. Reports of damages caused by the quake and aftershocks were not available immediately. Based on data of the quake's epicenter and hypocenter depth, the earthquake was a shallow one and caused by subduction activities of the Indo-Australia flank to Eurasia.